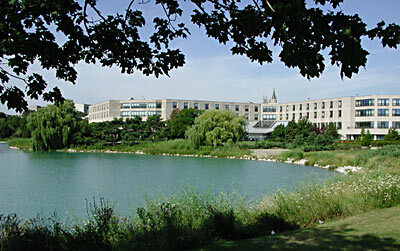 Located on the western shores of Lake Michigan in the heart of Northwestern University's Evanston campus, the James L. Allen Center is the home of Kellogg School Executive Education. Designed and managed exclusively to support the School's degree and non-degree executive offerings, the Allen Center hosts over 6000 executives annually to one or more of the School's 160 executive programs. Because learning should not stop at the classroom door, the Allen Center is designed to facilitate peer learning and informal interactions among faculty and participants. The Center is completely self-contained with classrooms, study group rooms, 150 bedrooms, dining rooms, lounge areas, snack rooms, laundry service and an exercise room. The goal is to create a special environment for learning that anticipates all educational and logistical needs in a seamless fashion, thereby minimizing distractions from the learning experience. Our classrooms and study group rooms feature both wireless and wired Internet connections and power outlets for laptops. To facilitate team assignments, the study group rooms also contain large flat panel monitors, smart conference tables, computers, printers, and presentation supplies. Students have twenty-four hour access to two participant resource areas with computers, printers, copiers, and office supplies and all of the bedrooms are equipped with Internet connections and voice mail. The Allen Center's front desk is staffed twenty-four hours a day and provides a wide variety of services such as restaurant and event recommendations, transportation arrangements, and FedEx services. At the Kellogg Knowledge Emporium, participants can purchase faculty books, other publications, and an extensive assortment of Kellogg School merchandise. Our past participants are often amused that life at the Allen Center seems to revolve around food, and they appreciate the innovation and expertise we bring to the table. An espresso café and omelet, panini, and granary stations add character to elaborate breakfast and lunch buffets. Our head chef works hard to delight your palate, creating sumptuous dinners with an international flair. Midmorning and midafternoon breaks, a cocktail hour, and well-stocked pantries for late-night snacks ensure that you will never go hungry. Kellogg School Executive Education participants also have guest privileges at the University libraries, the 140,000-square-foot Henry Crown Sports Pavilion and Lester J. Norris Aquatics Center, the University beach, and miles of jogging paths along the lakefront. Please note: Occasionally, demand for programs requires that participants stay at a nearby hotel. If that is necessary, arrangements (including daily transportation between the hotel and the Allen Center) will be made for you. It is expected that participants have their own health insurance that is valid in the United States. The University is not responsible for medical expenses incurred by participants during the program. © 2009 Kellogg School of Management, Northwestern University.